Texas Republican Mike Conaway, the House Agriculture chairman, wants more money for Southern cotton growers. Michigan Democrat Debbie Stabenow, Senate Agriculture’s ranking member, is pushing funds for urban farming and renewable energy. Their bitter fights over farm subsidies have deadlocked talks in a conference committee. The 2014 farm bill expired on Oct. 1 without a single face-to-face negotiating session between top negotiators in the three days before the deadline — a sign of just how far lawmakers are from any kind of deal. Congress is supposed to reauthorize the sweeping law every five years, but the stalled negotiations show how rancorous partisanship in Washington has overtaken even popular legislation that usually passes with bipartisan support. Rural lawmakers must now return home for midterm elections with little to show their farmer constituents who are hurting from low commodity prices and an onslaught of retaliatory tariffs. If a bill doesn’t pass by the end of the year, lawmakers would likely extend the current farm bill and then need to return to square one on new legislation next year. The other two leaders in the talks, Republican Senator Pat Roberts of Kansas and Democrat Collin Peterson of Minnesota, have been watching as their counterparts go head-to-head behind closed doors. “[Conaway] and Stabenow are fighting over this stuff, and Pat and I just sit and look at each other and roll our eyes,” Peterson told POLITICO last week. “They want to take money from each other to pay for what the other one doesn’t want,” he said. At times, Conaway has lost his temper during negotiating sessions, according to a source familiar with the discussions, who was granted anonymity to speak candidly. Another source said both lawmakers had grown heated during talks. “It’s been spirited, it’s been thoughtful, it’s been constant,” Conaway said recently, of the negotiating sessions. Sniping has sometimes been public, even personal, prompting recent attempts by the four principal negotiators to make a show of unity. The four leaders were photographed walking arm-in-arm while they exited a meeting Thursday. At the heart of the impasse is how the farm subsidy pie will be divvied up among regions of the country. Stabenow and Roberts oppose House provisions that the Congressional Budget Office projected would send more cash to farmers in the Southern Plains, including more than $ 500 million to cotton growers, a top constituency in Conaway’s West Texas district. In order to offset the cost of that proposal, the House bill would shrink subsidies for row crop farmers across the country. Conaway isn’t happy about how the Senate bill would eliminate a $ 2 billion perk for rural utilities that borrow from the federal government, a trade-off that opened up funding for a number of Stabenow’s priorities, including initiatives promoting renewable energy development and local and regional food, research funding for urban and indoor farming, and assistance for beginning farmers and ranchers. Even before the House and Senate bills cleared their respective chambers in back-to-back weeks in June, the farm bill conference committee was expected to have a tough job. The House bill boosted work requirements for food-stamp recipients, an approach rejected by Democrats. Conaway has dug in on the proposal for stricter food-stamp work requirements in his bill, and President Donald Trump has publicly backed him up, but the provision has no chance of passing in the Senate — a political reality that makes compromise essential to reauthorizing the law. 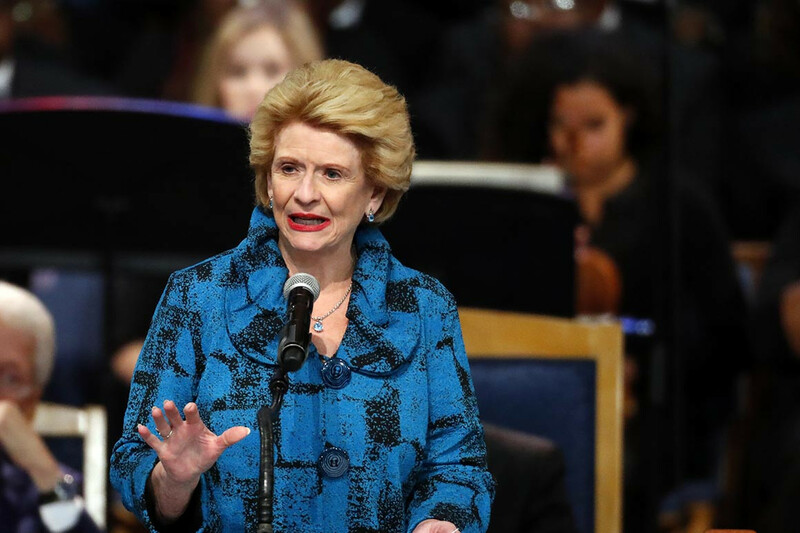 Stabenow said some progress was made on less-controversial titles but that the “big titles are still open” and that there are still disagreements over the commodity, conservation and energy titles. House Republicans, staring down midterm elections that most polls suggest favor Democrats taking over the lower chamber, have blamed Stabenow for the failure to pass a farm bill before the deadline even though Roberts has also objected to Conaway’s proposals on farm subsidies and SNAP. In September, Trump tweeted that Stabenow and the Democrats “are totally against approving the Farm Bill” because they would rather oppose the House’s proposal on SNAP work requirements. Trump didn’t mention that Roberts also is opposed and even pushed against a Senate amendment to the farm bill that resembled the House’s SNAP plan. Stabenow, who is up for reelection, fired back, stating that politics wouldn’t distract her from working across the aisle to finalize a farm bill. Four days before the farm bill was set to expire, the House and Senate Agriculture committees released a joint statement that touted a shared commitment to advance the talks. Included in the statement was a photo of the top four negotiators sitting around the negotiating table. But two days later, Conaway blamed his Senate counterparts for the stalemate. “Getting the farm bill done is really important, but it’s got to be important to everybody negotiating, and right now I don’t get the sense that getting something done has quite the sense of urgency with my Senate colleagues as it does with me,” Conaway said in a video message. That same day, Rep. Ralph Abraham (R-La. ), one of 47 House members on the farm bill conference committee, issued a statement accusing Stabenow and her Democratic colleagues of delaying farm bill talks in hopes of retaking Congress in the midterm elections. Abraham said Democrats were altering their demands, “asking for ridiculous things like crop insurance for rooftop gardens and other urban farm priorities,” while putting “vital” agriculture programs at risk. The statement appeared to mock Stabenow’s priorities and was seen by insiders as a window into Conaway’s frustrations. Liz Crampton contributed to this report.